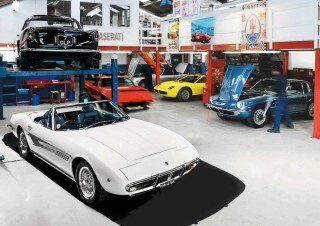 Epic Restoration Resurrecting a deceptively decrepit Maserati Ghibli SS Spyder. 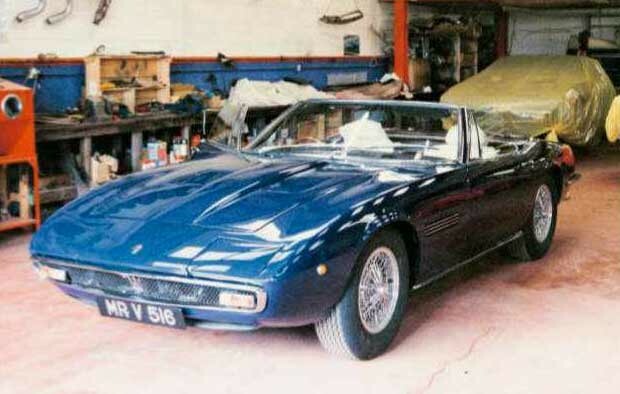 ‘When you sat on the bootlid, the door gaps opened up!’ Careless past work and corrosion made the concours restoration of this ultra-rare Ghibli SS Spyder a far bigger task than expected… Words Nigel Boothman. Photography Dean Smith. Twisted Maserati Ghibli restored. The perils of trying to untwist the chassis of a Maserati rarity. Stephen Dowling first walked into Bill McGrath Maserati one day in 2004. Andy Heywood had just moved from managing Britain’s best-known Maserati specialist to becoming the proprietor, as McGrath himself retired. From this first meeting grew some significant projects including the restoration of Dowling’s green Ghibli coupé, Kermit. 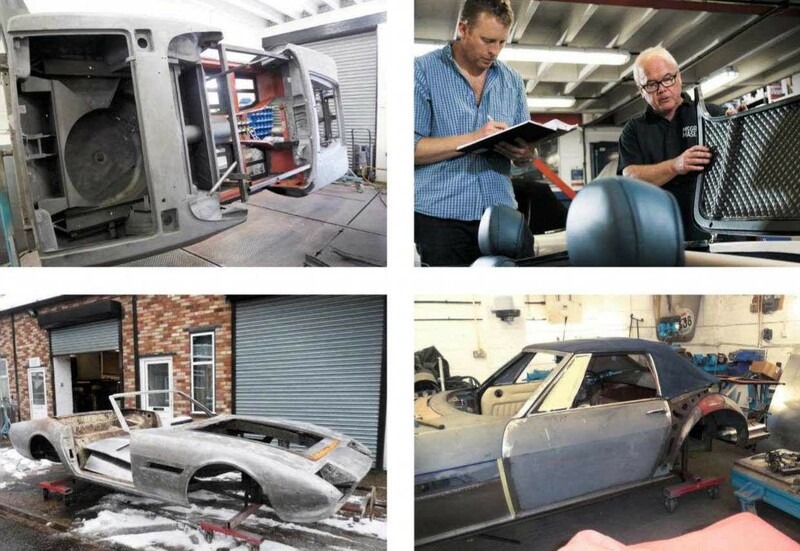 The car, at this point painted Blue Sera with cream upholstery, was shipped from Brisbane in 2012. It made an appearance on the Maserati Club stand at the NEC Classic Motor Show that year, but Dowling knew from using it that it was getting tired and Heywood could see that all was not well with the body. Serious skin complaints addressed When the structural issues were remedied, attention turned to the outer panels. Beneath the paint and filler, corrosion had extended into the door skins and frames, so both doors received a new skin. Prestige was obliged to recreate around two-thirds of each door frame and mate it with what could be saved. The mission to save as much useable steel as possible was hampered by both rust – the bonnet skin came back from stripping with barely enough steel to hold a layer of paint – and previous bodges. 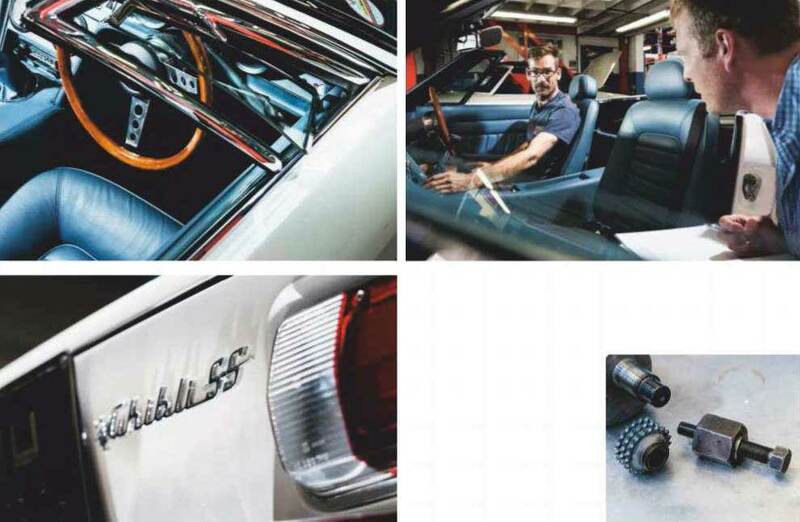 ‘In the Seventies and Eighties, rusty bits were patched and hidden under paint and underseal, while damage or dents might be knocked out in such a way that the body lines aren’t where they should be,’ says Willis. ‘It’s really easy to get it wrong with the Ghibli unless you see a good one and you know exactly how the crease should interact with the wheelarches.’ Like many classic Maseratis in the UK, this Spyder is a returning visitor to the premises in Kimpton, Hertfordshire. McGrath Maserati had been asked to do work on the car in 1989 for a previous owner, but this time it could go well beyond the scope of that job. ‘It had a partial restoration here nearly 30 years ago, in its blue phase,’ says Heywood. ‘The kind of work that Stephen wanted this time is so much more thorough than anyone was attempting back then.’ Willis and his team altered what they could and cut out other areas to get the lines lowing as they should. But the knock-on effects of one small change can be immensely time-consuming, as he describes. The dry it stage is crucial, but especially so in this restoration. It returned to McGrath Maserati in 2016 to be built up with glass, trim, latches and handles. Every opening panel was positioned and checked. It took four months. The Ghibli’s dry-sumped V8 has scavenge and delivery oil pumps driven from the nose of the camshaft and prone to damage, but this car escaped with the minimum of attention from Wilson to keep the oil where it should be. ‘I had to machine a groove for an O-ring around the outside of the perimeter of the pump body,’ he says. McGrath Maserati also originates new coil springs for these cars, made to their own specification to get as close as possible to what Maserati offered when new. The back axle is a tough Salisbury unit with a plated LSD, which was rebuilt by GKN in Birmingham. Soon the team had a lovely collection of refurbished Ghibli components and needed a Ghibli to attach them to. Yet another obsessive rubdown by hand followed the application of the primer, leaving the car ready for the top coat of Bianco Polo Park, confirmed by Maserati Classiche as the finish with which the car left the factory. For a perfectly original touch, Heywood’s team found a way to recreate the factory’s textured finish for the coating in the engine bay – no artificial shine where once there was none. At this point, in 2017, a year of work was still ahead as the car’s trim, wiring and build-up gathered pace. But before that it had to get back on its wheels. Duncan Berry turned the Spyder into a mobile object once more by assembling the numerous powder-coated suspension and steering components. With the driveline in place, attention turned to the brakes. 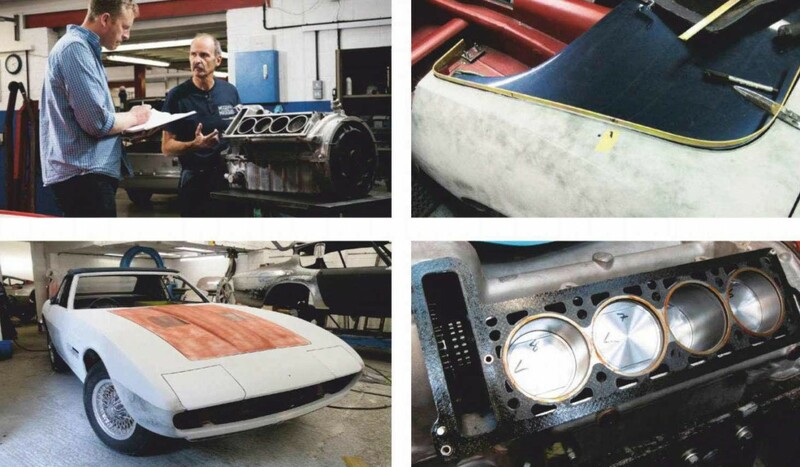 If you’re thinking this was a ‘replace everything’ restoration, think again – Berry et al really did re-use parts where possible, rescuing the brake discs and rebuilding calipers with new seals and fresh plating. ‘We made our own wiring loom,’ says Heywood. ‘The loom in this car was a bit hacked around, and that plus age and deterioration meant it needed to be renewed.’ The Ghibli was treated to an original Maserati-branded Autovox radio Heywood had squirreled away and the best ashtrays they could find in the stores. ‘The new windscreen was a challenge,’ says Berry. ‘It was made by Pilkington but the rubbers came from Italy and were a harder compound than original.’ Originality gave way to pragmatism for the sun visors. They’re beautifully trimmed in leather, but would have been heat-welded plastic when new, a process you can’t replicate without a Seventies car factory. Malcolm Barton, McGrath’s trimmer, had trimmed the car in the cream leather it gained in 1989. ‘It held up pretty well,’ he says, ‘but we were going for originality and Maserati confirmed the car originally used Connolly PAC 1545 blue, so that’s what we used. Luckily Connolly has started making the PAC leather – printed and crushed – as it did 45 years ago.’ With a straightened and powder-coated hood frame supporting the perfectly matched blue hood, the finishing touches came from McGrath’s reproduction Fiamm and AGIP decals, placed just as in 1971. 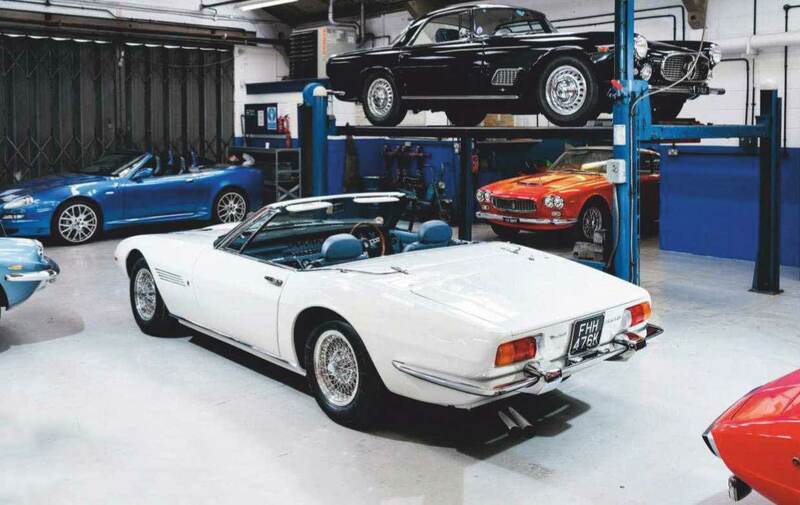 From top: after flirting with selling the Ghibli, Stephen can’t bear to part with it; McGrath Maserati trimmed the car in 1989, but this time fitted Connolly hide in its original colour; badge makes it one of four right-hand-drive Ghibli SS Spyders. The Spyder at McGrath Maserati in 1989. It took three years to turn the twisted and bodged body into a painted shell resplendent in its original Bianco Polo Park. Bracing frame held structure in place during repairs Most of the lower metalwork had to be remade. Steel inner arches made repairs difficult. Diamond-pattern quilted PVC under tonneau was hand-sewn by the long-suffering trimmer. Alloy cylinder head and block were resin treated to resist porosity. Engine has to be heated to 150°C to remove the cylinder liners. V8 needed new cylinder liners and pistons. Chromed trim strip was remade by hand in brass, then plated. Back at McGrath for the crucial dry-it process.